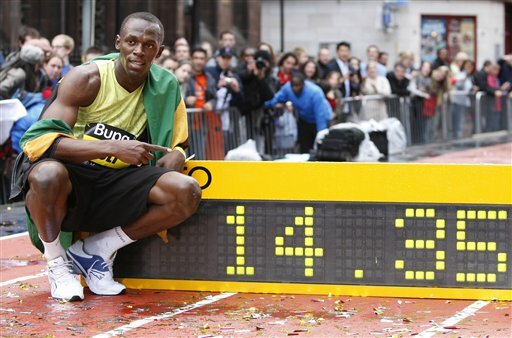 Triple Olympic World record holder Usain Bolt added another record to his tally in Manchester England when he blasted to the finish line in the 150 meter street race in 14.25 seconds. Thousands gathered around the special track set up in the center of the City of Manchester to watch Bolt and he did not dissapoint. “It’s my first major competition of the season so I was just happy to come out and run injury free and run a good time.” Bold stated after the race. Usain bolt has repeatedly stated that his goal is to repair and enhance the image of track and field worldwide which is often tarnished by drug scandals. Bolt made good use of his time in Manchester and took the oportunity to watch his favourite football team Manchester United play and as his luck would have it, he was able to be present when they lifted the English Premire League title with a 0-0 home draw against Arsenal which puts then in untouchable position at the top of the league with 87 points. All eyes are on Usain Bolt and the entire Jamaica athletics teams as they compete in track and field events which leads up to the most important event on the 2009 track season calendar the IAAF World Champions in Berlin Germany which gets underway on August 15th through to the 23rd.